1998: Article on Cuba in A Cultural History of Latin America. A Cultural History of Latin America edited by Leslie Bethell brings together chapters from Volumes III, IV, and X of The Cambridge History of Latin America. The essays place Latin American literature, music and visual arts in historical context, from the early nineteenth century through the late twentieth century. Topics include narrative fiction and poetry; indigenous literatures and culture; the development of music, sculpture, painting, mural art, and architecture; and the history of Latin American film. Each chapter is accompanied by a bibliographical essay. The following excerpt about Cuban Architecture is taken from pages 375-377. 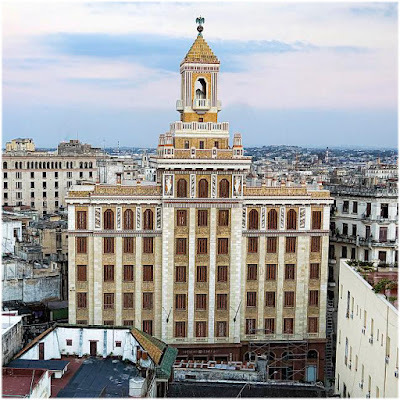 During the first three decades of the twentieth century the great buildings of Havana were for the most part designed by U.S. architects and built by U.S. companies. 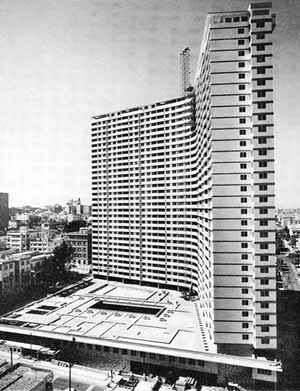 This was the case, for example, with the Hotel Nacional by McKim, Mead and White. The styles which still dominate in these buildings are either French classicism (revised by the Academie des Beaux-Arts) or ‘Californian' on a gigantic scale, correctly designed but with no serious attempt at architectonic innovation. McKim, Mead & White, Hotel Nacional. Photo: Bin in Garten. In the Havana of the twenties, other enormous buildings were erected like La Metropolitana1, designed by Purdy and Henderson. The Parliament2 building (1929) was built in neo-classical style, with the indispensable cupola, designed by Raul Otero in collaboration with J. M. Bens and others. 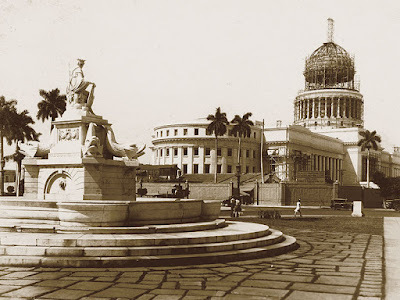 Otero, Bens et al., Capitolio Nacional, under construction. Source Umbrella Travel. Also in the 'colonial' style was the 'skyscraper' for the Cuban Telephone Company in Havana (1927),the first of its kind in the city, designed by the architect Leonardo Morales. Within the current opposed to historicism, two movements began to reach the Caribbean, movements which moved in parallel in nearly all of Latin America in the 1930s. These were functionalism and, to abbreviate, the style we will call art deco. The latter, for example, was brought to Havana by the architect E. Rodríguez Castells, designer of a famous building for the Bacardi Company (1929), the noted rum distiller. E. Rodríguez Castells, Edificio Bacardí. Photo Christopher Michel. 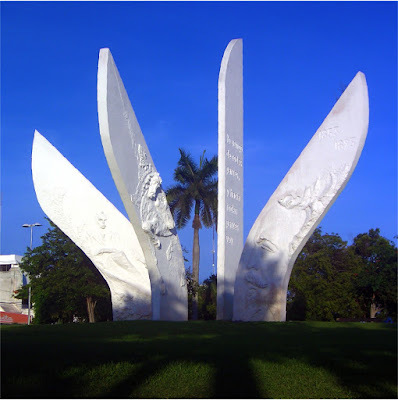 Also on the Cuban scene various Spanish immigrants made their appearance, including the architects Martín Domínguez and R. Fábregas, many of them members of a group called GATEPAC which was affiliated to the Congrés International d'Architecture Moderne in Barcelona. 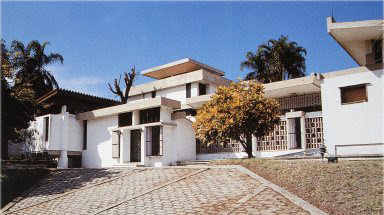 People like Domínguez and Fábregas transmitted the message of functionalism, which would soon produce interesting designs like those by two local architects, Alberto Camacho and the future colonial art historian Joaquín Weiss (1894–1968). Emilio de Soto, Maternidad Obrera. By the 1940s, Cuba was already more in step with the derogatorily labelled ‘international style'. The architect Emilio de Soto built apartment buildings in Havana along these lines, and even the Maternidad Obrera clinic (1939) in Marianao. Mario Romañach, Casa Rufino Álvarez. However, the real point of departure for the best modern tendencies took place through people like Max Borges and Mario Romañach, who specialized more than anything else in private homes. 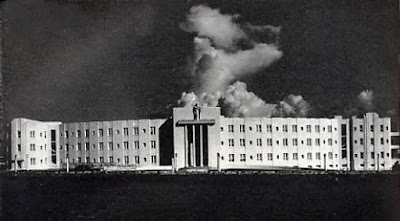 Large projects, meanwhile, were awarded to Emilio del Junco, Miguel Gastón and Martín Domínguez, who designed, for instance, the Radio Center (1947). 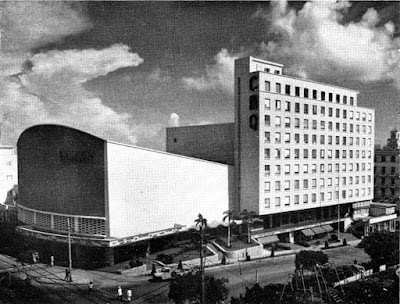 Emilio del Junco et al., Edificio Radiocentro. In the fifties there was a great stirring of architectural activity throughout the Caribbean. 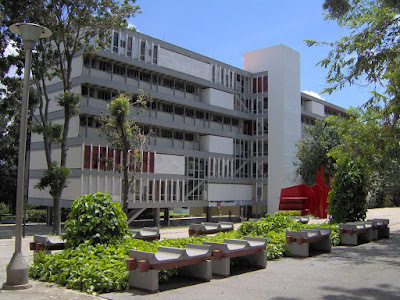 Thus, for example, in Havana Arquitectos Unidos enlarged the Edison Institute (1954), while Ernesto Gómez Sampera completed the great residential complex of Focsa (1956). In the Caribbean it has frequently been the luxury hotels that have served to introduce and diffuse modern architectural trends. 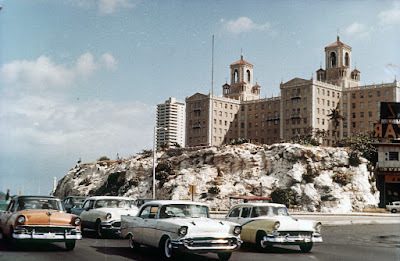 First there were those of the Vedado neighbourhood in Havana. Ernesto Gómez Sampera, Edificio FOCSA. 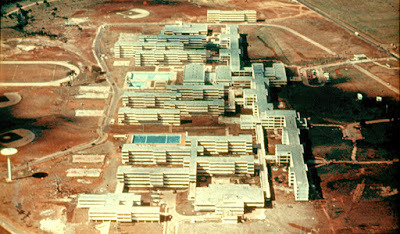 In Cuba after the Revolution the buildings best representing the new architectural experimentation were the East Havana Neighborhood Unit (1959–63), and the famous National School of Plastic Arts and the National School of Dance in Cubanacán (1960–63) by Ricardo Porro, which were an attempt at an original synthesis of African and colonial elements, the substrata of Cuban culture. 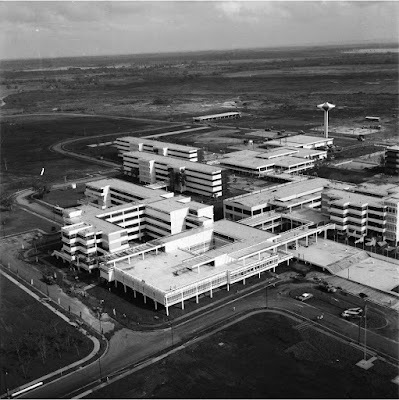 Perhaps the most transcendental was, however, the Ciudad Universitaria José Antonio Echeverría (1961—70) by Humberto Alonso et al., on the outskirts of Havana. All the required conditions are present in this excellent design: consideration of the climate, transparency of walls, the provision of abundant areas of shade. Humberto Alonso, Ciudad Universitaria José Antonio Echeverría. Andrés Garrudo, V. I. Lenin Vocational School. In the seventies, 5oo schools were built for no less than 300,000 children. 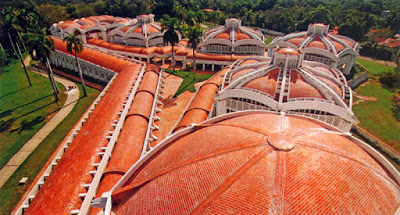 Three important projects should be mentioned: the V. I. Lenin Vocational School (1972—74), by Andrés Garrudo; the Máximo Gómez school (1976), in Camagüey, by Reinaldo Togores; and the Ernesto Guevara Palace of the Pioneers (1979), by Néstor Garmendia. Reinaldo Togores, Máximo Gómez Vocational School, Camagüey. Finally, built along very pure aesthetic lines, we must mention the new Cuban Embassy in Mexico City (1977) and the José Martí Monument (1978) in Cancún, both created by the talented architect Fernando Salinas3. F. Salinas y J. Delarra (escultor), Monumento a Martí en Cancún. 1 Edificio La Metropolitana, 402 O´Reilly Street corner to Aguacate. Old Havana. 2 Better known as "Capitolio". 3 With Sculptor José Delarra.